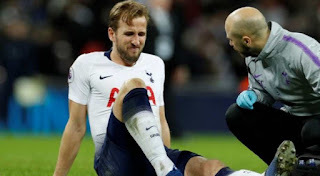 England captain Kane, who is Tottenham's top scorer with 20 goals in all competitions this season, hobbled away from Wembley on Sunday after picking up a knock towards the end of the 1-0 defeat by United. Kane's absence looks a major blow for Spurs, who are currently third in the league, with their totemic striker now set to miss key derbies in the league as well as big cup ties at home and in Europe. Kane will be out of the League Cup semi-final second leg against Chelsea at Stamford Bridge next week, which Tottenham are leading 1-0 thanks to his goal at Wembley in the first match. He is also likely to miss both legs of the Champions League last-16 clash against Borussia Dortmund. With Son Heung-min jetting off to represent South Korea at the Asian Cup, manager Mauricio Pochettino's goalscoring options will be tested in the coming weeks. Spurs, who are nine points behind Premier League leaders Liverpool, could also be without Kane when they face top-four rivals Chelsea (Feb. 27) and Arsenal (March 2). It leaves Pochettino with Lucas Moura and Fernando Llorente to call upon as replacements up front, as the manager has already confirmed the club are not looking to sign players in the January transfer window.